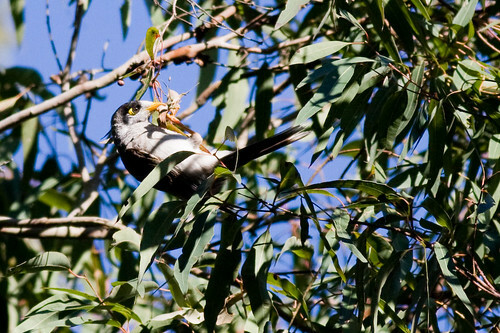 Canberra Bird Photography, 29th August 2009. This morning we got up early and went to the Jerabombera Wetlands off the end of Newcastle Street. The weather was a bit overcast but it looked like it might clear up and the sun would come out. When we got there to the wetlands it was looking very grey indeed. We saw a few rabbits and lots of rabbit holes near the hide. The rabbits really have made a big mess. There were a few water birds in the pond – Grey Teal and Purple Swamphen but not much else. Some Superb Fairy-wrens were flittering around in the trees. After that fantastic start, it begins to rain, so we went home. When we got home there were a bunch of European Goldfinch in the trees around the apartments, so I got out the camera and took some photos of them. 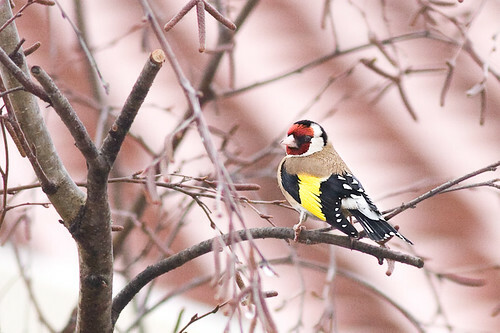 European Goldfinch (Carduelis carduelis) were introduced to Australia in the nineteenth Century. They are found mainly in settled areas, farm lands, gardens and parks. They eat smaller seeds and in summer they feed on insects as well. Their average size is about fourteen centimetres. The other day at Cooma I saw a few Gang Gang Cockatoos in the park. I rushed off to get my camera but by the time I had got back they were gone and a gang of crows were ruling the roost. I suspect that the park was the territory of the Australian Ravens and had chased off the Gang-gangs. At Mount Selwyn there were copious Australian Ravens and Australian Magpies who were working the slopes and the car park. I also saw what were Scarlet Robins on the road above the snow line. Yesterday I got a free tick on the way to Canberra. I stopped off at the Tarwang Rest Area which is just before you get to Goulburn on the Hume Highway. I had started out from Newcastle with shorts, thongs and a T-shirt and my toes were starting to freeze, so I stopped to put some warm clothes on. The wind had been blowing extremely hard all the way. In fact last night Melbourne was hit with massive winds that blew down trees and power lines. 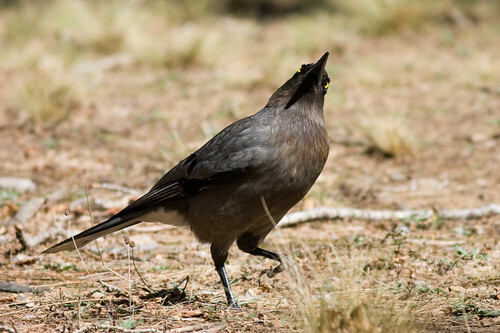 Well, while I was putting my shoes on, I saw a currawong, and I thought to myself that it was a Grey Currawong and I had not seen one of these before. I had better get a photo of it. So I hurriedly got ready and grabbed the camera and went chasing this Grey Currawong around the picnic area. Grey Currawongs are out of area for us in Newcastle. This bird was race versicolor (Stepera versicolor versicolor), the nominate race for this species. Race versicolor is mainly distributed in South-east Australia in southern New South Wales and Victoria. 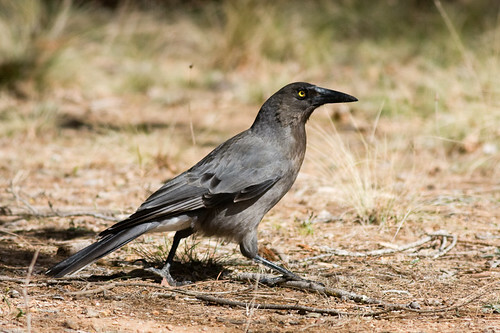 The Grey Currawong has a size from 45 to 53 centimetres. Their preferred habitat is low, open forest, woodlands, mallee heath, scrub and agricultural fields when foraging. Ash Island Bird Photography 22nd August 2009. This morning I went on the monthly Ash Island Wader Survey with Neville. We started at 9 am to co-incide with the high tide that was at 9:30am at a height of 1.59 metres. The morning was mostly overcast with the sun coming out occasionally. At 2pm the temperature was 19 degrees Celsius. We started off at Scotts Point, spotting a few Australian White Ibis and Chestnut Teal. I spotted an immature White-bellied Sea-eagle being harassed by a crow. I have been wondering lately why the raptors do not strike out when being attacked by crows. And why they get attacked. I know magpies will attack raptors who come into their territory when they have young ones. We checked the water holes along the way and came back onto Milham Road and had a look at Milham Ponds, where there were a few White-faced Herons. Coming in around the other side of Milhams Pond we saw a pair of Red-kneed Dotterels on the southern side. There was very little on Phoenix Flats, just a pair of Masked Lapwings and some Red-capped Plovers. We went back to Milham Road, past Melaleuca Swale, and followed the Hunter River to get onto Ramsar Road. On Teal Waters there were some Chestnut Teals and Black Swans, and around the back past Chat Flats there was nothing. Usually there are some White-fronted Chats there, but more about them later. We went down Wagtail Way past the Swan Pond which had a couple of Black Swans on it but not much else, except some Black-winged Stilts over the other side. Around the other side we went, where we saw a Swamp Harrier and possibly a Brown Goshawk near Bittern Corner. And that was it for Ash Island. Crested Terns Mating, Newcastle Baths, 20th August 2009. 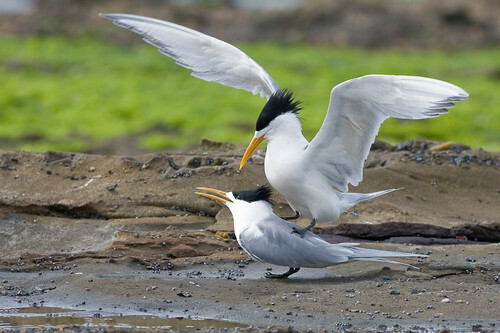 Crested Terns make nests as shallow scrapes in bare sand, rock or coral. The nests are usually on flat open ground, often not lined but sometimes have grass, stones or bones lining them. They breed regularly in a relatively short season each year and at the same time each year. On the south coast of New South Wales, courtship behaviour and breeding takes place between July and August. 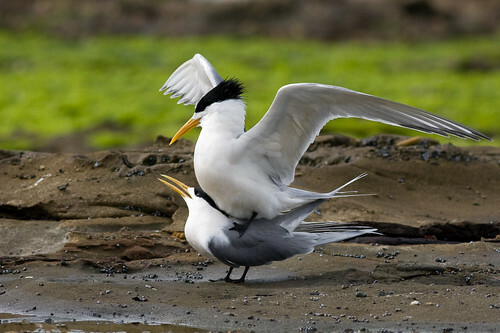 Crested Terns first breed when they are two years old, following an elaborate, spiralling courtship flight. 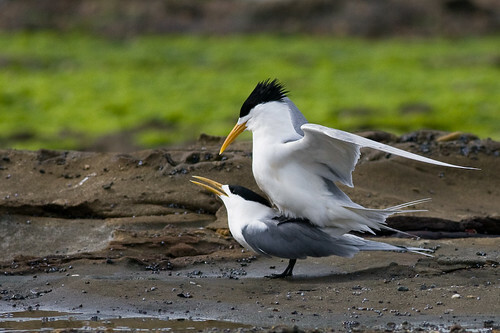 The courtship flight of the Crested Tern involves the pair flying in a mirage image of each other, wing tips close, with great speed and grace, often spiralling high into the air. This pair started circling each other first, the female on the right squawking loudly. Note the raised crests of them both, especially the male on the left. The squawking continued throughout the mating. Then the male jumped on top, balancing on the back of the female. 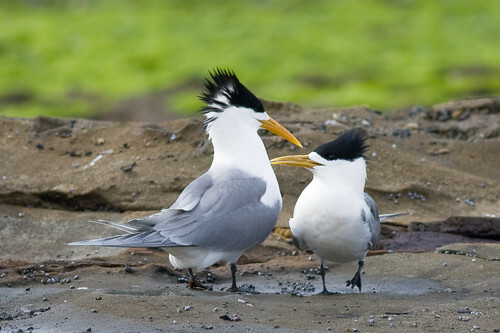 This female looks to be smaller than the male, but I am unsure if this is general amongst Crested Terns. 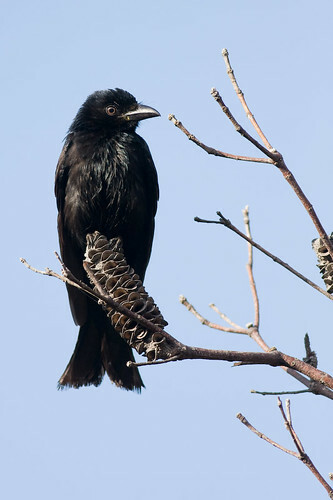 The female has yet to raise the central part of the tail feather. Note that the female has now raised the tail feathers. I am not sure how mating occurs from these photos because I thought their cloacas had to come into contact. Tomago Wetlands Bird Photography, 18th August, 2009. I went to the monthly Tomago Wetlands bird survey this morning. We all met up at Tomago House, then drove into the wetlands. 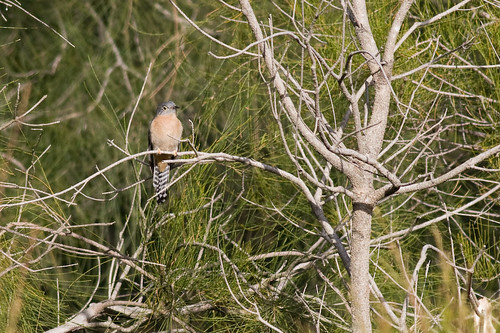 At Tomago House we spotted an Australian Hobby on one of the tall pine trees. We stopped at the tidal gates and saw some Brown Honeyeaters, Red-browed Finch and Mistletoebirds going in and out amongst the casuarina and mangrove trees. Then we took off to the rice paddy to do our usual circle around it. We had a good look for some Southern Emu-wren and had some fleeting glimpses of a few, as well as some Golden-headed Cisticola. We did manage to spot a Fan-tailed Cuckoo off to the south. A few of the crew walked into the swampy middle bit and flushed an Australasian Bittern. These birds are listed as vulnerable and we eventually saw 4 of them. We had been hearing Yellow-tailed Black-cockatoos all morning and eventually we saw about half a dozen of them roosing way off to the west. 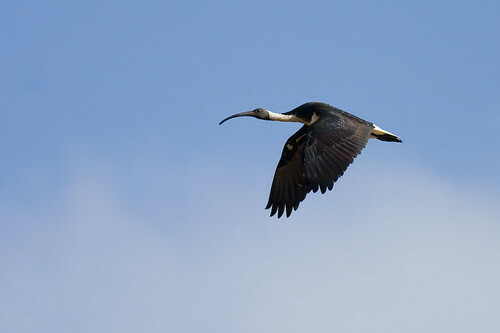 There were a lot of Australian White Ibis and Straw-necked Ibis hanging around together in large groups on the ground. We did manage to spot some Fairy Martin (Hirundo ariel) who were flying around. The diagnostic features for the Fairy Martin are a rufous head, whitish rump and square tail. They were said to be possibly nesting in pipes at bridges. After the obligatory birdwatchers morning tea at the tidal gates, we went to the eastern section of the wetlands. Straight away we saw a pair of Nankeen Kestrels hovering and hunting over the field. We thought that it was an adult and a young one being taught how to hunt. You could hear their cry of “kee, kee” quite clearly. 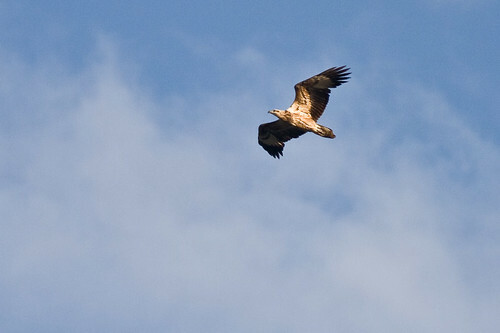 We also saw a Whistling Kite displaying and a pair of Swamp Harriers were soaring over us as well. There were so many raptors around. We just had to look up and see something. In all we saw five species of raptors – White-bellied Sea-eagle, Australian Hobby, Swamp Harrier, Nankeen Kestrel and Whistling Kite. Back at the casuarinas, an Olive-backed Oriole was singing the most beautiful songs. I thought it was a Noisy Friarbird until I saw him. It was glorious. Korsman’s Landing, Myall Lakes National Park, 13th August, 2009. I drove from Seal Rocks last night to Bulahdelah and then down Bombah Point Road. I wanted to go over the ferry to Mungo Brush and then on to Tea Gardens and back on to the highway. But the ferry was down for maintenance or maritime survey so I just went to Korsman’s Landing and stayed there the night. In the morning I was awoken by an cacophany of Noisy Friarbirds and Noisy Miners skwarking away in the blackbutt trees fighting over the blossoms. There was a house boat on the wharf and a Whistling Kite wheeled over us. The people in the house boat showed me a pair of White-bellied Sea-eagles roosting on a dead tree on the other side of the lake. 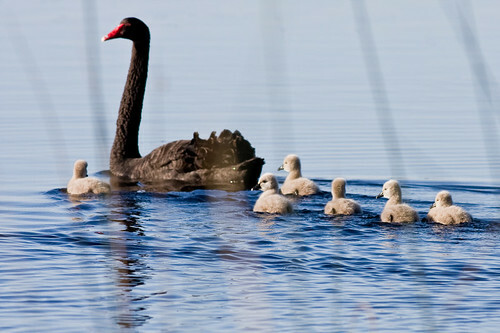 After that I went for a walk around the lake shore and saw a pair of Black Swans with six baby swans. 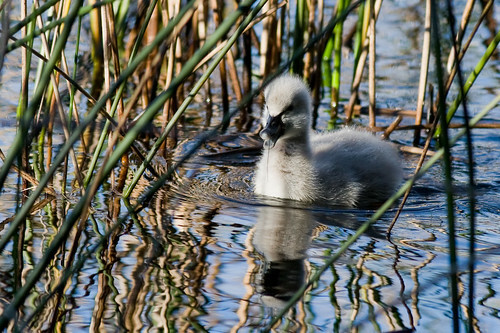 Are they called cygnets or ugly ducklings? Sugarloaf Point Lighthouse, Seal Rocks, Myall Lakes National Park, 12th August 2009. In the afternoon I drove to Seal Rocks hoping to find some surf. I went out at the Point but it was very bumpy. After a nanna nap and some lunch I trudged up to the lighthouse at the end of Boat Beach. 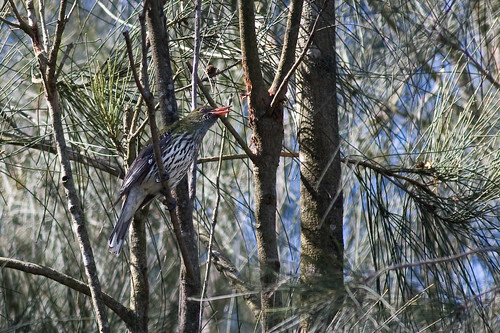 There were lots of honeyeaters around on the track, mainly Lewin’s Honeyeaters and Yellow-faced Honeyeaters. A fair few of the stringybark/Blackbutt type trees had blossoms on them, so that was an attraction for the nectar-feeding birds. 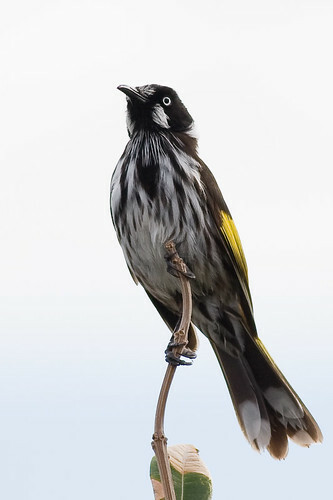 Around the lighthouse there were lots of New Holland Honeyeaters and they were flying around all over the place and posing on the tops of the trees as they usually do. 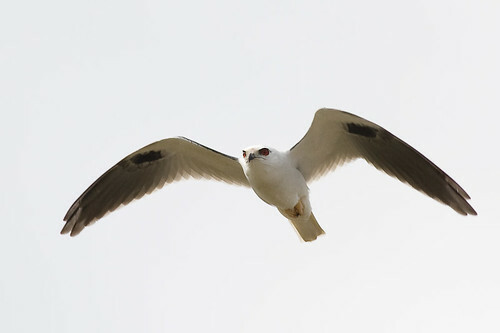 I talked to the ranger who said that there were a couple of White-bellied Sea-eagles around and they also get Whistling Kites and Nankeen Kestrels around the lighthouse. Up at the light itself, I spotted a White-bellied Sea-eagle sitting on of the seal rocks below the lighthouse. Later on, another one joined it. I waited for a while for them to come and soar over me, but they just sat there, so I eventually got bored and walked back to the car. lol. Elizabeth Beach, Booti-Booti National Park, 12th August 2009. Just near the car park at Elizabeth Beach in Pacific Palms there is a wonderful rainforest walk. It leads from the road to the beach. There are heaps of palms and vines and rainforest type foliage. lol. I saw this weird looking pigeon with a punk rock hairdo. I thought it had a flat head when I first saw it. I thought “That poor pigeon has had its head smashed in”. 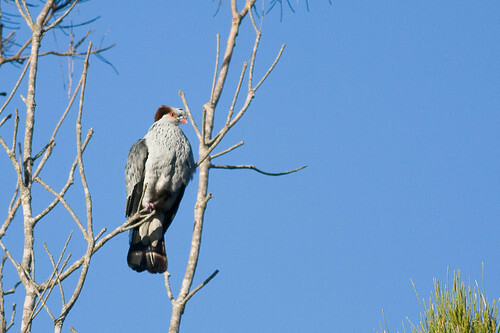 But of course it is a Topknot Pigeon and it really does have a weird haircut. They seem to migrate south from Queensland in autumn and winter. They are commonly found in rainforests and wet forests. They are also called a “Flock Pigeon”. Later on I saw a heap of them on a high tree on the edges of the rainforest section right next to a suburban street. I followed the rainforest walk to the beach, then went along the beach to the hill at the northern end, and started walking up it. It was pretty steep and was hard going so I only lasted half an hour or so – that was enough for me. There were not many birds around anyway. doh! There were more birds in the streets than the bush. 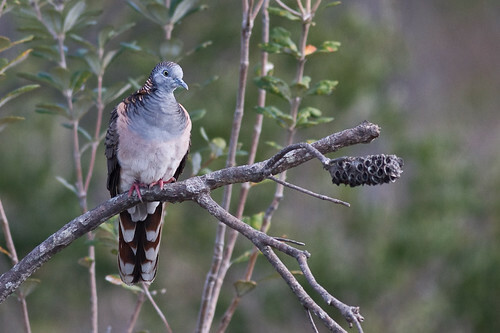 Galahs, Red Wattlebirds, Crested Pigeons and Spotted Turtle-doves were all hanging on the wires, Television aerials and trees around the houses of Elizabeth Beach. After that I drove over to Tiona and walked up Booti Hill from the other side. There were a few birds around, mainly White-cheeked Honeyeaters and Brown Thornbills, and I saw a White-faced Heron on the beach. 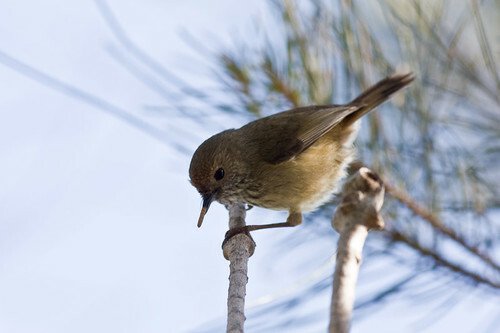 This Brown Thornbill has some kind of tubular object in his top beak. I cannot work out what it is – maybe a casuarina needle or some kind of insect larvae. What do you reckon? Wash House Beach, Kattang Nature Reserve, 11th August 2009. In the afternoon I drove to Laurieton and had a look at Dunbogan Beach. I thought I had seen another Eastern Reef Egret so I rushed off to get my camera. I got side tracked along the way because I thought I heard a bowerbird along the track, as well as a whipbird. But I ended up seeing nothing at all. doh! After that misadventure, I went over to Wash House Beach to look for the White-bellied Sea-eagles and the Ospreys. I walked along the beach having a look at the rock shelf, then walked back. As I was nearly off the beach, the pair of White-bellied Sea-eagles flwe over and hovered for a while in the north east wind that was blowing quite strongly that afternoon. They then took off over to the other side of the headland. They came back again later and a young one was with them. 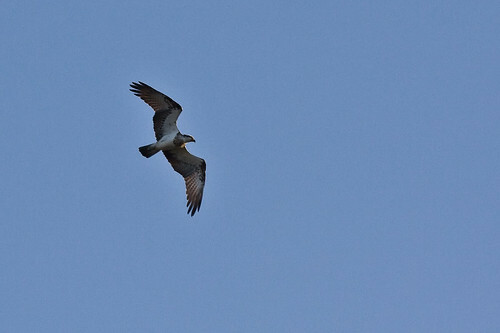 And then the Ospreys turned up and had a go at the White-bellied Sea-eagles, and started hovering over the beach. After a short while, they flew off. I was not expecting much but I did happen to see some raptors for the day, at least. Connors Track, Hungry Head, Hat Head National Park, 11th August 2009. After driving to Hat Head from Crescent Head, I camped at Hungry Head Camping Area. It is quite a popular little spot. After an early breakfast up at Hungry Head, I wandered down Connors Track, which goes all the way to The Gap which is at Korogoro Point. It would have to be one of the most scenic walks on the coast. It is very spectacular. I was hoping to see raptors – Brahminy Kites especially, and also White-bellied Sea-eagles and maybe an Osprey or two, but I saw zero. And I was also hoping to see Australasian Gannets diving for fish but again, no dice. But I did manage to see a few kangaroos on the way. There was a pretty big north easterly swell running along with a nor’easter wind, so that may have had something to do with it. The track wanders through quite a few different habitats – from Banksia, to heath and some scattered rainforest-like sections. 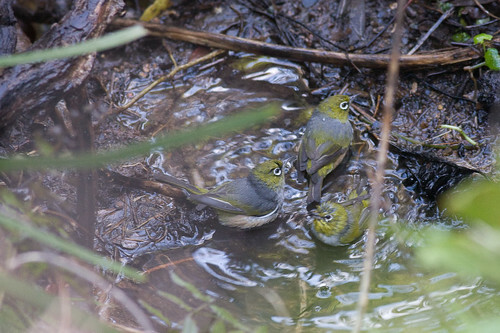 There were a couple of little soak streams running down the hills towards the ocean, and at one pool some Silvereyes were having a drink and a bath. I think this Spangled Drongo had just had a bath in the same stream as the Silvereyes. As per usual, just as I reached the car and getting ready to put away the camera, there was a couple of Bar-shouldered Doves perched on a branch right next to my parked car. It always happens. After that, I had a look at Korogoro Point to see if there were any Ospreys fishing, but there were none. I did happen to see an Eastern Reef Egret fly in from the point and hung out in the rocks by the sheltered creek. By that time the nor’easter was really howling.